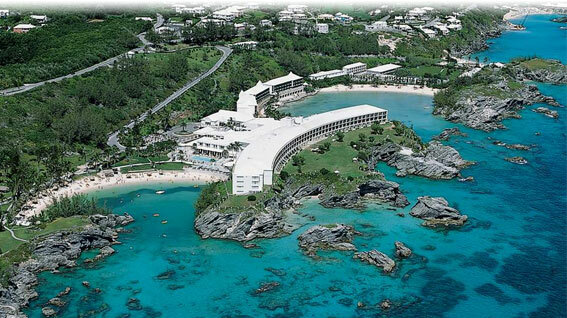 Estimates put Bermuda's population at 65,365, with the majority of African descent, (54.8%). Caucasians make up 34.1% of the native population, with 10% of Portuguese ancestry, and 6.4% multiracial. The average Bermudan is between 15 and 64 years of age with the majority, (22,828), female. Over the last 160 years, it is estimated that a significant segment of the population has emigrated from the Portuguese-held islands, primarily the Azores, accounting for the rapid rise in Portuguese ancestry. The large percentage of African peoples is naturally due to the slave trade, since the island was used primarily as a way station for slave ships sailing from Africa to the New World. The Bermuda islands, located off the east coast of the United States, are the northern-most islands in the Caribbean, approximately 1,100 miles northeast of Miami, Florida, and only 640 miles from Cape Hatteras, North Carolina. 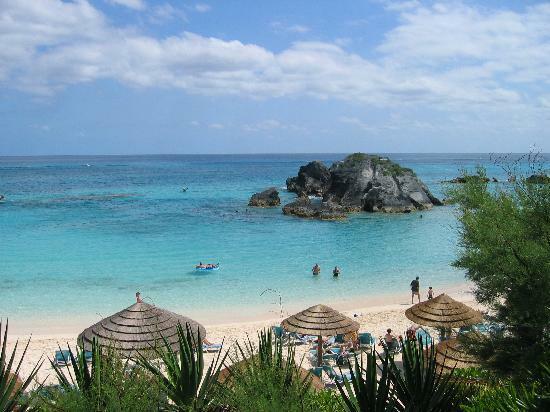 The oldest remaining British overseas territory, Bermuda boasts an abundance of natural and man-made attractions that make it a popular tourist attraction for visitors from both the United States and a large portion of the UK and Europe. Although situated at the northern-most tip of the infamous triangle that bears its name, this tiny island is still a popular destination for cruise ships and air passengers alike, with over 785 historic homes, crenulated forts, and natural caves making sightseeing a year round pleasure for both young and old. In addition to the rich historical landmarks you can find a healthy nightlife in the two most populated cities, Saint George and the capitol, Hamilton. Near the western edge of the Sargasso Sea, Bermuda is roughly 670 mi) east-southeast of Cape Hatteras, NC, and on the same approximate latitude as Savanna, Georgia. Amazingly though, the climate is still humid subtropical because of its position near the Gulf stream, and the warm westerlies, carrying warm, humid air eastwards over the island. Composed mainly of low hills separated by fertile depressions, Bermuda's humid atmosphere lends itself well to tropical growth and a variety of plants that are rarely found at such latitudes. Despite the islands small size much of the topography is covered with lush subtropical forest. 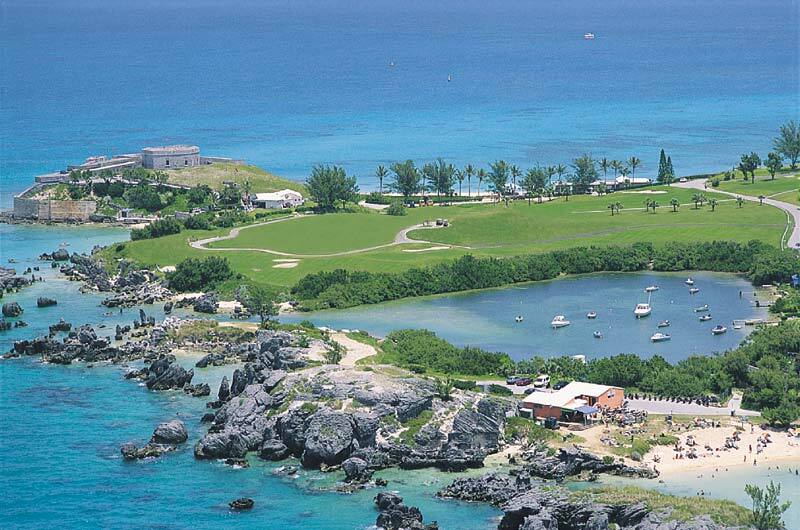 Bermuda was discovered in 1503 by Spanish explorer, Juan de Bermudez, and served as a replenishment spot for fresh meat and water by both the Spanish and Portuguese fleets sailing back and forth from the New World. The Island was claimed for England under the extended charter of the Virginia Company. 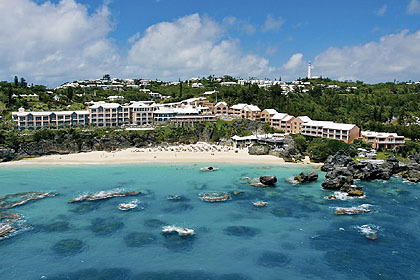 St. George's was settled in 1612 and was named Bermuda's first capital. Bermuda has remained a holding of England ever since, and is still one of the few English colonies whose mannerisms are almost exclusively British. Gibbs Hill Lighthouse, the world's oldest cast-iron lighthouse, rises 245 feet above the seaside hill that bears its name. A climb to the top offers one of the most spectacular views of the island and the ocean to be found anywhere. 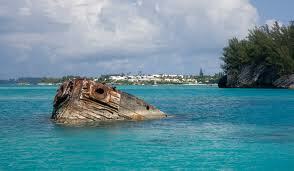 Commissioned in 1795, Bermuda's former Royal Navy Dockyards is now the home of the Bermuda Maritime Museum. Sights include such historic buildings as the former fort's massive keep, and the commissioner's house. The museum itself houses exhibits that cover a wide range of history, including the island's seafaring trade, slavery, and tourism. The Crystal Cave tour is a classic show cave excursion that has proven to be as popular with the Bermudans themselves as it is with tourists from around the globe. Crossing a pontoon bridge over an illuminated, 55-foot-wide underground lake reveals a wonderland of stalagmites and glittering rock formations. There's also a gift shop and a restaurant on site. Hamilton serves as the island's central nightlife hub, with the largest concentration of the island's bars and clubs, providing a venue for Bermuda's finest jazz artists, as well as offering drink promotions and live music or comedy acts on an ad hoc basis. Outside of the city there also exists a thriving nightclub scene within the various hotels, and during the summer, cruises are offered weekly in addition to beach parties. 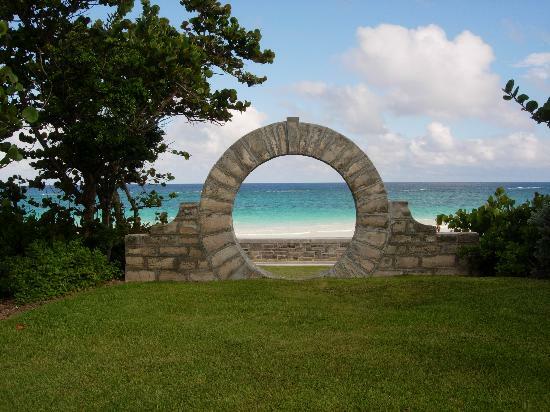 In addition, Bermuda offers a thriving arts community with the City Hall of Hamilton providing a venue for visiting artists, as well as the Masterworks art show in the Botanical Gardens, and the Arts Center in Dockyard. There are also live performing arts offered at Rock Island Coffee Cafe, the City Hall Theatre, and the Ruth Seaton James Auditorium. Bermudans are more British in their customs than any of the remaining British Commonwealth islands. They enjoy cricket as a national pastime, drive on the left side of the road, and have Queen Elisabeth's portrait on their bank notes. Even so, Bermudian English is much more like American English than British, and the Bermudians are far more conservative in their ways than either country. They are sticklers for protocol, love pomp and ceremony, and consider it rude to speak with someone without first saying "good morning", or "good afternoon". The island is predominantly Anglican (23%), with Roman Catholic, and African Methodist Episcopal following respectively. The balance of religious beliefs are mostly Protestant, with a smattering of more eclectic beliefs. There are several dishes served on the island that are unique to Bermuda. Not surprisingly, fish is one of the main ingredients in Bermudian cuisine, and plays a major role in most traditional Bermudian dishes. Culinary delights such as pan-fried fish, fish chowder, and codfish and potato are staples of the Bermudian diet and are enjoyed throughout the island. Another traditional favorite, formally called Bermuda Hop 'n' John, is now known as Peas 'n' Rice. Dessert dishes include loquat, or banana crumble, as well as desserts that are made from seasonal strawberries and cherries. These, and many other international desserts, can be found throughout the island.